We are happy to offer an opportunity to enjoy an hour experience of authentic Japanese tea ceremony with a bowl of matcha green tea and tea sweet at Setsugekka East Village. If you are interested, please make a reservation. 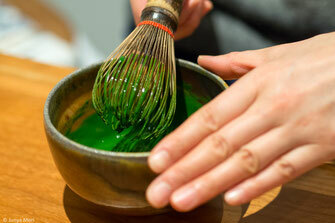 Koicha is very thick matcha served in a formal tea ceremony, which is roughly four times as thick as usucha, thin tea. We will offer an opportunity to experience koicha in an authentic style, so we will serve it for three to five people in one tea bowl at the counter in Setsugekka. Please share it with your loved ones, or you can drink it up by yourself. If you are wondering whether we are able to provide the tea ceremony for a special occasion, please contact us.